These Pewter gifts are available as cufflinks, and tie slides. The cufflinks and tie slides are provided in an attractive presentation box. A range of different designs are available, including different fly selections, fly reels and types of fish. 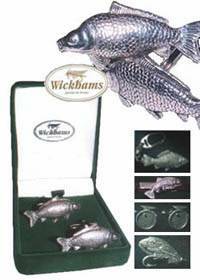 Made by Wickhams and are hand crafted to give a superior finish.